According to data that 314 Action provided HuffPost at the end of January, more than 60 candidates with previous careers in STEM were running for federal office and another 200 for state legislatures this year. HuffPost called it “the largest number of scientists to run for public office in modern history.” Neither organization provided updated numbers of candidates following the primary elections. President Trump’s battle against climate change science emerged anew when he accused scientists behind climate change research of having a “very big political agenda” during a “60 Minutes” interview with Lesley Stahl that aired on Oct. 14. His remarks came less than a week after Category 4 storm Hurricane Michael devasted Florida and the U.N.’s Intergovernmental Panel on Climate Change (IPCC) released a report warning that the current rate of Earth’s warming will raise temperatures to a level that will incite intensifying food shortages, wildfires and massive coral reef loss as soon as 2040. Yet Trump asserted that he will not adapt his economic policies to limit fossil fuel usage. The IPCC report builds on the scientific community’s consensus that Earth’s climate is changing due to human activity and that impacts of climate change will be widespread and severe. 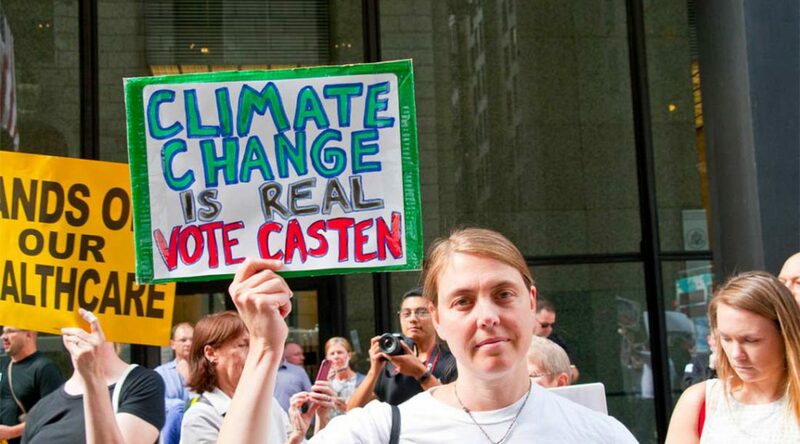 Casten, a clean energy entrepreneur who holds master’s degrees in biochemical engineering and engineering management, is heavily focusing his first political bid on energy and climate policy. He pledges to champion stronger pollution standards and mandates for fossil energy reduction. Foster, a physicist who has held office since 2013, likewise denounced Trump’s “60 Minutes” comments. Foster holds a Ph.D. in physics and conducted research for the Fermi National Accelerator Laboratory in Batavia for 25 years before turning to politics. His campaign advocates increased investments in scientific research, including research around new energy technologies. First-time candidate Lauren Underwood is a registered nurse who served as a senior advisor at the U.S. Department of Health and Human Services in the Obama administration. Underwood supports expanding access to healthcare, investments in renewable energy and a fully funded Environmental Protection Agency. The November elections will reveal how much the public values STEM candidates. Casten faces incumbent Peter Roskam (R) in a highly competitive race. Casten said an internal poll released on Oct. 8 showed him with a five-point lead. The Chicago Tribune editorial board endorsed Foster over his Republican opponent Nick Stella, while Underwood raised four times as much as her opponent, Rep. Randy Hultgren, in the third Federal Election Commission filing quarter, according to a press release issued by her campaign on Oct. 16. “I’m progressive because I recognize that climate change is real and that we need to have solutions that would stem the impact of climate change,” Underwood told the Chicago Tribune.